Welcome to another edition of Connect The Chords! 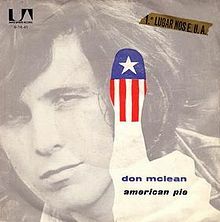 In this episode we’ll disect Don McLean’s 1971 masterpiece American Pie. This song has a whooping 13 chords. But, if we break the chord progression down into logical segments you’ll see it really isn’t that difficult of a chord progression to internalize. First, listen to the song in the video making mental notes of where in the lyrics you hear the chord changes. The song is in the key of G. You’ll notice the basic chord progression in the verse is I-V-vi-ii-IV-vi-V. Play this progression over and over until you have it in your ears and under your fingers. As you work your way through the verses you’ll see minor variations of the main progression. (Don’t worry about those suspended chords now, they are just garnish) The chorus is a basic I-IV-I-V followed by a vi-II7-vi-V7 tag. Once you are familiar with the basic chord progression hum the melody and play through the song slowly listening to the changes. After you’ve done this you’ll be ready to play along with the video at tempo by ear. Good luck and have fun! The day, the music died. This’ll be the day that I die, this’ll be the day that I die. I knew I was out of luck the day the music died.